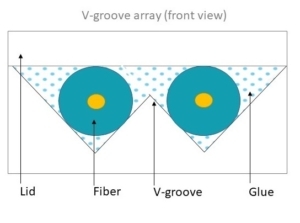 IDIL Fibres Optiques realizes 2D fiber arrays that can be placed on a silica V-Groove or other specific optical supports. We provide a wide range of fiber arrays made from any type (single-mode, multi-mode, polarization maintaining…) and any length optical fibers. 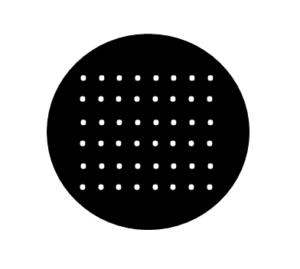 Thanks to its expertise IDIL offers high-precision engineering as regards optical fibers positioning. 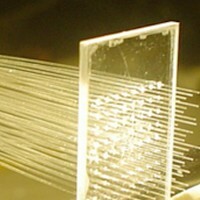 We can also stick optical fibers together and then polish the array. Thanks to our specific machine we realize a precise polishing according to customer’s required angle and with a better than 0.5° accuracy. 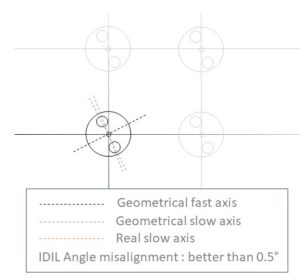 Furthermore, IDIL provides pigtails intended for interferometric applications. We guarantee the same length among those pigtails thanks to an accuracy to within 1 mm. In addition, we can fit different types of connectors at the output of fiber arrays. Do not hesitate to contact us. 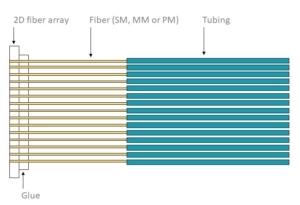 Fiber array is an essential components used in different applications to connect the optical fiber to its waveguide. IDIL provides unique assembly/cutting/polish processes to get the best accuracy of fiber core position with perfect Polishing surface.